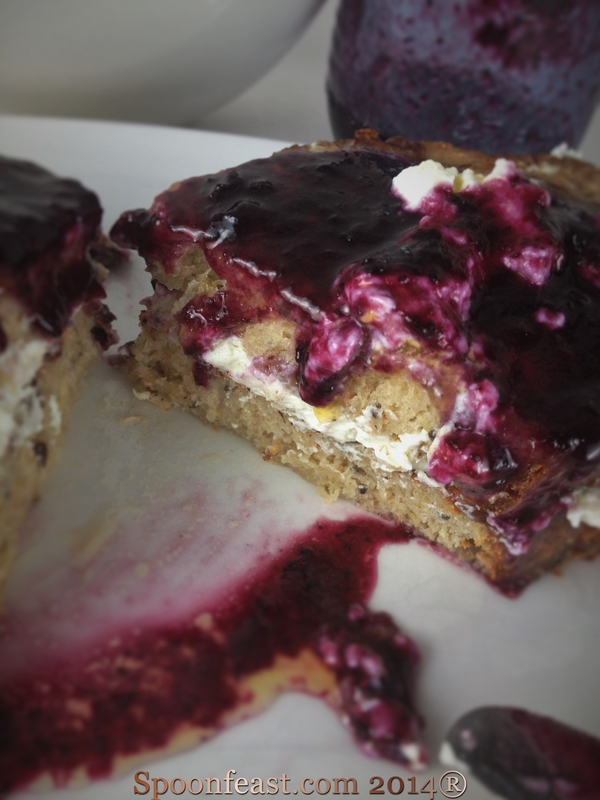 French Toast Stuffed with Goat Cheese and Slathered in Blueberry Sauce is delicious and nutritious although not diet food. This dish came to me while trying to use up some things to make room in the refrigerator. I make 95% of the bread we eat and typically use lots of grains in the loaves. We buy organic eggs from the farmers market and the blueberry sauce is made from a batch of berries I bought to make a pie but never did. So instead of the berries going bad (I couldn’t believe no one ate them!) I made a sauce. The recipe is below and is very simple. Mix all the ingredients, except the bread, in a flat pan. Place the sliced bread in the egg mixture, turning to coat. Let the bread sit in the mixture so it can soak it all up. Heat a pan large enough to hold all the slices, place the soaked bread in the hot pan and cook until each side is golden brown. Place the French Toast on a warm plate, immediately spread the goat cheese on one side of the bottom slice, top with another slice of hot French Toast. 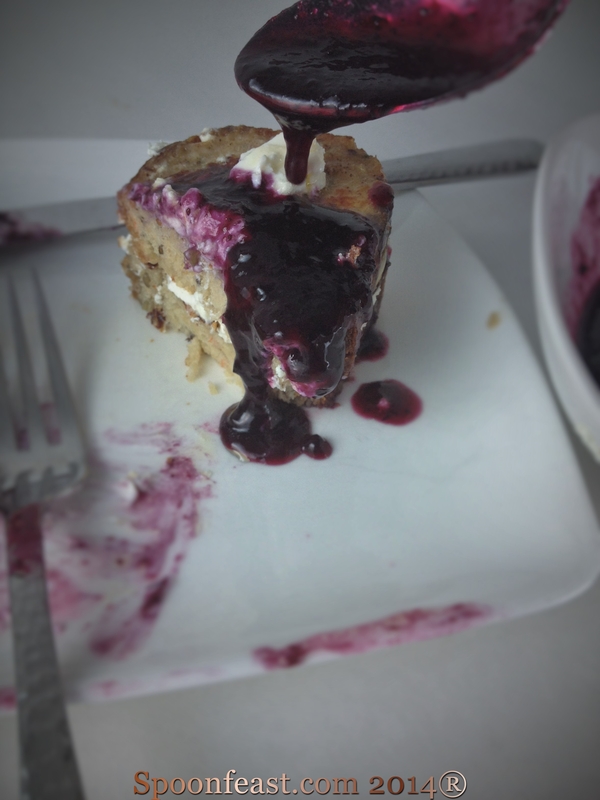 Pour Blueberry Sauce all over and serve. Now if you wanted, you could whip some honey and cinnamon into the goat cheese before spreading it onto the French Toast. It would put this dish completely over the top! This is soooo good! And made with whole grains so you will feel full and had great energy all morning. Like I said, not diet food, but whole, real food. I hope you try this recipe and enjoy every bite. Wash and pick through the blueberries. Discard and soft, moldy or squished berries, leaves, stems and twigs. Combine everything into one pan and bring it to a boil. Simmer for about 10-15 minutes, until its thick. If you want the sauce smooth, put it in a blender or use an immersion blender to puree the sauce to the desired consistency. I like mine to have a few whole berries left in it. You can always choose to put some fresh berries with it when you serve it too. This sauce is great on this decadent French Toast and over pancakes, ice cream and even over grilled salmon. Treat yourself and try that one! 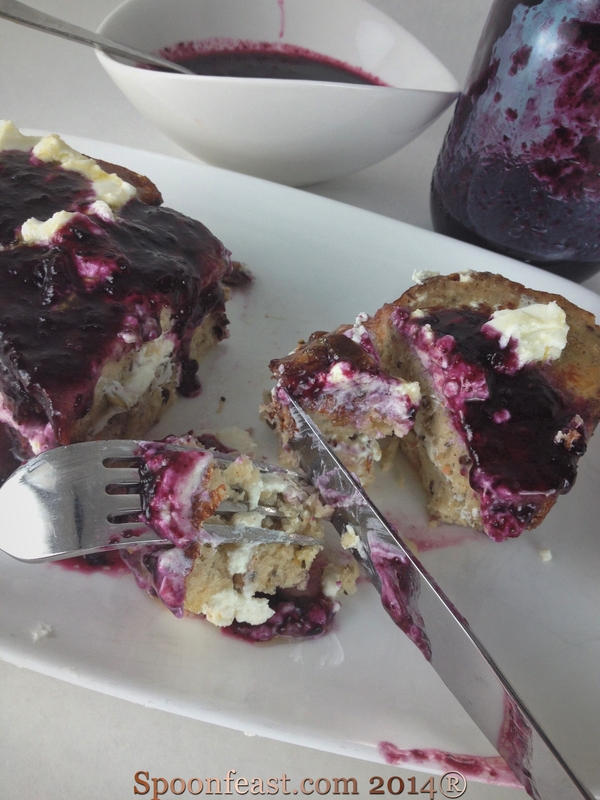 This entry was posted in basic skills, Breads, Breakfast, Cooking, Recipes, Southern Cooking and tagged blueberries, blueberry sauce, blueberry syrup, french toast, Goat cheese, stuffed french toast. Bookmark the permalink. This looks SO delicious, need to try this! It IS good! Let me know how you like it!